Sunday morning: Windy, snow showers and 0 Celsius. OJ and TJ are packing and preparing for the 3-hour drive to Kirkenes airport. I will stay until Monday morning since I have meetings not too far away from here. The Mount Loran equipment was dismantled yesterday, along with another 400 GB of overnight recordings. Not too exiting stuff from first looks, but with that location you never know. Below is the equipment we used. Since entrance to the area was restricted last summer, a wheelbarrow is absolutely crucial for transporting the equipment the 850-metre walk up to the listening post. The vertical climb is 40 meters, half of it during the first 200 meters. PC/SDR box with cover/camouflage, antenna reel and wheelbarrow. Saturday's dinner was a variant of the traditional Norwegian course fried saithe fillets with grated carrots and potatoes. We added red onion and bacon for more flavour. We had Calles Riesling with the fish. For dessert we had another round with assorted cheeses and another bottle of the superb port wine we had on Friday. So! KONG37 has come to the end! The Mount Loran beverage was a great success, and we hope to have access to the area next year too. If not, we have a plan B site which is potentially almost as good. To round off, here's a photo of "Shag Island" where the shags are doing feather maintenance after a dive. The seagull in the middle seems a little lost. KONG37 - 24 Hours to go! 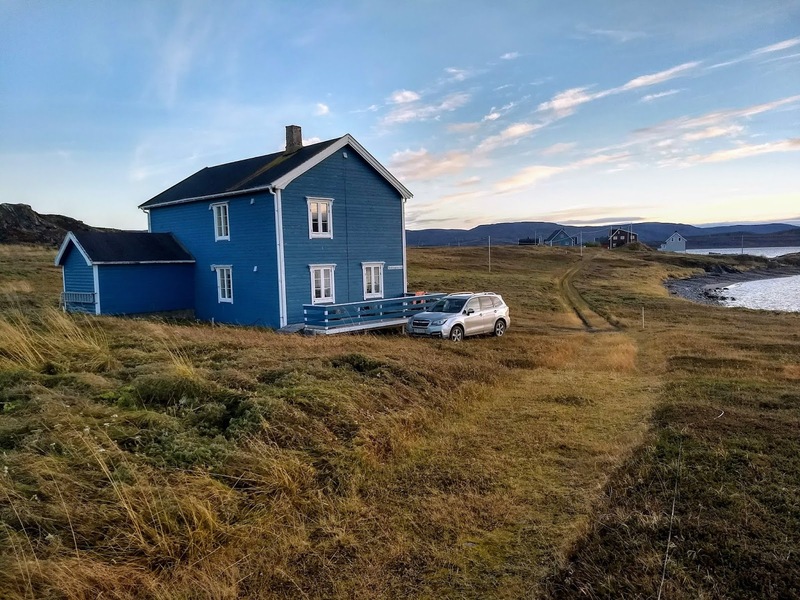 We are approaching the end of another DX-pedition! Things have worked out well, both with regards to the logistics, equipment, weather (at least until today), and most certainly meals & drinks! We have had some spells with very interesting conditions as well. Again, we see that very quiet solar conditions tend to make propagation boring for those who have heard a lot. So, a sudden jump in polar K-indices is not a bad thing. Below is an overview over solar weather from October 14 to 26. Jagged JIX lines (red) indicate fluctuations in signal levels due to changes in the geomagnetic field. Those changes may produce very interesting propagation, and interesting stations! Yesterday's JIX was indeed jagged. At first a bit disappointing to see signal levels rise rather late, around 23:00Z, too late for eastern daytime stations. But propagation was inland, so we found a few less common daytime or day power stations, like KSDP-CO 750, KTIC-NE 840, WKAR-MI 870, KOEL-IA 950 and WRRD-WI 1510. Then signal levels declined sharply...so, was this it? Not at all! Because western stations came up at around 01:00 for another daytimer chase, including KFIO-WA 1050, KFZS-WA 1280, KYOZ-WA 1330 and KPXQ-AZ 1360. Enough radio talk. Dinner talk! For starters, left-overs from Wednesday's Västerbotten pie. We had lots of veal shanks too left from Wednesday, so we added some water and vegetables and made a stew out of it. Very tasty, and with a Côtes du Rhône to match. For dessert we had assorted cheese - leftovers! The port wine was no leftover though, a delicious Dow's 2006 Quinta do Bomfim. Today's tough challenge will be at Mount Loran later today. 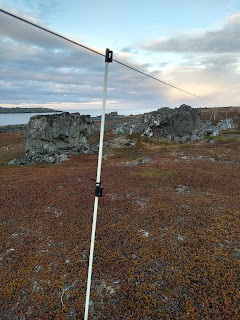 Taking in 1000 meters of wire, and carrying that and all the other stuff 850 meters to the car in 10-13 m/s (22-30 mph) wind and snow showers is no fun job. But we had lots of fun loggings there! Below is from this morning, an hour or so before sunrise. Conditions, although "good" in terms of signal levels, appeared less interesting than the day before, with far less daytimer signals - one exception was WCJW-NY 1140, and traces of KOUU-ID 1290. Checking Mount Loran recordings from the day before turned out to bring a few surprises, especially from 06:00Z towards noon. And especially on the lower part of the band. Some stations of interest in the morning were KNRS-UT 570, CKWW-ON 580, CHNL-BC 610, KFPT-CA 790 and WKY-OK 930. Many other west coast stations were noted. CJWW Saskatoon 600 is a daily guest here so nothing spectacular about that, but click on the link if you want to hear a super strong signal! The usual Pacific dominants were there, but again, nothing of interest from New Zealand and Australia. 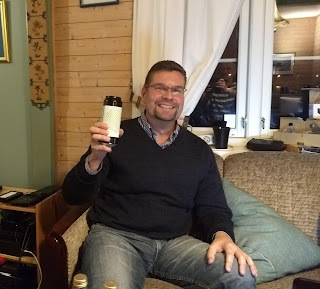 Thursday was shopping day, and Thursday was also Sauna & Dinner at Kongsfjord Guesthouse day! Excellent old-style salted cod with bacon, and cloudberry panna cotta for dessert. And a little aquavit. The weather is wetter - and windier. 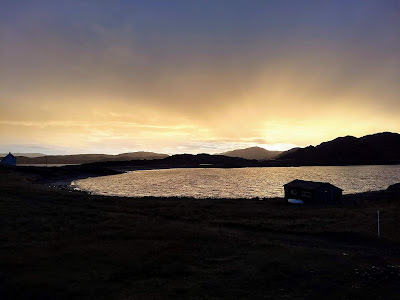 Yesterday had rain showers most of the day, changing to sleet in the evening as the temperature fell to near zero Celsius. As I am writing this, Ole has just left for a 1000-km drive to Andøya in what the met office describes as "difficult driving conditions". Here is from the first mountain pass he will cross. 48 hours from now, the rest of the crew will leave. Another day with more of the same as the day before. Still no proper daytime openings towards the Americas, but there was a small time window for stations like WLNL-NY 1000, WPLB-NY 1070, WDZY-VA 1290, WHGT-MD 1590 and a few others. Early in the morning we also noted KIHU-UT 1010. Propagation lasted well into the afternoon with common stations for that time period, such as KEYG-WA and KDBM-MT 1490. The Pacific islands were again early, and strong, as this trace of Kiribati-1440 (red circle) shows. Nothing new though. Then at 10:36Z we got a message from Mika in Aihkiniemi to "Please try listen to V7AB if you can now". Whazzup??? So we tuned to the super-strong V7AB Marshall Islands 1098, where the announcer aired greetings from Jim and Mika to us! Listen to the last part of it here. This time we got the meals procedures back on track. For starters we had a modified Västerbotten pie where the original Kalix roe (hard to find) had been replaced with Arctic roe from lumpfish. 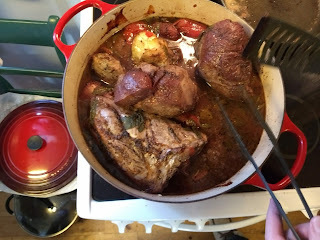 The main course was Veal shanks barolo, cooked with tomatoes and three bottles of Barolo red wine for 7-8 hours. The selected wine was.... Barolo! But not just any old Barolo, it was the Fenocchio 2011. For dessert we had properly made Créme brûlée and Amaretto. And Grappa. Weather was mostly calm, partly cloudy and light rain showers from the northeast throughout the day. Maximum temperature was 4 Celsius. It's starting to cool off a bit now, so we will likely see more wind, snow and sub-zero temperatures towards the weekend. More than half way! But still no proper daytime opening! And still no super New Zealand and Australia opening! Mount Loran does deliver nice things though, like WNVY-FL 1070, WSQR-IL 1180, WIBW-KS 580 and XEGS-SN 610. And recordings from previous days (and weeks!) also reveal interesting stations. Asia/Pacific was less inspiring, but as usual, Tonga-1017 and Kiribati-1440 were up with nice signals early in the day. The band was rather noisy at the time. The Daily Dinner Report: For starters we had - uh, well we sort of didn't start. The main course was reindeer tenderloins and a potato paste with bacon mixed in. And a sauce with onion, shallot and leek. For dessert we had - uh, well we sort of didn't have that. Assorted cheese were chosen, but we all fell asleep in various body positions usually not associated with sleeping. So....! Some morning rain, but the rest of the day was partly cloudy, dry and calm. Excellent for my first KONG37 8.5 km run. Temperatures around 4 Celsius, though colder in the morning with snow on the mountains. Pictures below were taken before sunset, hence the reddish glow. Conditions overnight were influenced by the coronal hole, which caused "dips" and "bumps" in the Yaslog. The most interesting "bump" allowed clear reception of 300-watts daytime, 2-watts nighttime WLDS Jacksonville IL 1180 for a few minutes, actually peaking above KYES! Pacific signals started promising, and several NZL stations were noted around 10:00Z, especially good signals from Radio Sport 1332 and 1377. The band was noisy though, and the opening fizzled out anyway. The only common meal we have on the KONG DX-peditions is dinner. Any other time of the day, anyone for himself. Ah, and yes, there is a Cafe Latte/Cappucino routine at 9 am as well. However, since Jim was about to leave for further exploration and eventual return to Finland, we did a brunch with sourdough bread and whatever we could throw on the table. Which is usually quite a bit. So Jim left us with a happy smile on his face and a couple kgs of king crab to share with Mika. Final repair works with the dual 340 beverage was done in the fine weather. Otherwise we checked recordings, such as a great opening we had on October 5 on Mount Loran. And finally, dinner! Starter: Salmon sashimi with boiling sesame oil and roasted sesame seeds, chives and cilantro. 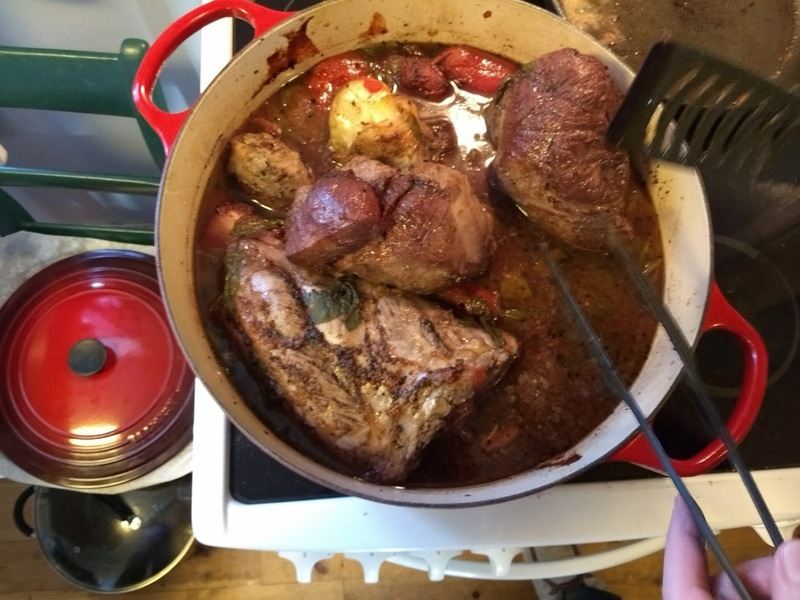 The main course was a leg of lamb, veeery slowly baked, for almost 9 hours! Served with a paste of root vegetables, and a rather spicy sauce with onion, leak and red chili. Red jelly and custard for dessert. An audio file to show the signal strength of one of the common stations here: KSJB 600. The picture was taken after the 340 beverage repair was done, around half an hour before sunset. Calm and dry, around 4 Celsius. Late October really can't get any better than this. - 500 meters, 50 degrees. - 570 meters, 80 degrees. - 275 meters, 310 degrees. - 2 x 340 meters, 340 degrees. 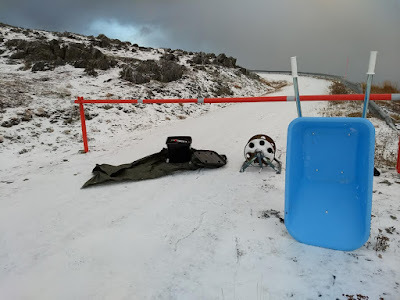 We also have a temporary setup at Mount Loran: 1000 meters, 306 degrees. - Impregnated fence poles. More durable than fiberglass, and my chosen material for supports on my property, where stealthiness is not an issue. 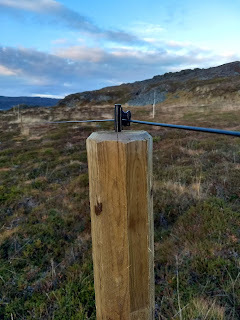 - Fence poles with added weight. 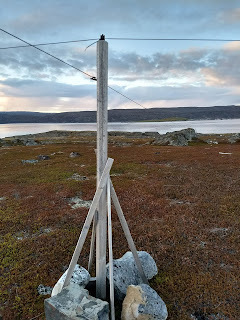 Needed where the ground is rocky or where two antennas meet. The 310 beverage has very sturdy, long fiberglass poles which are supported by impregnated fence poles. Nothing lasts forever though. Around 5 % of the poles need replacement every year. The antenna wires, although exceptionally solid, need replacement every 4-5 years, sometimes more often. The winter is unforgiving. Conditions towards North America appeared a little less unfocused on Sunday than on Saturday, so a little more interesting. The Mount Loran recordings haven't been checked properly yet. Stations from the Pacific started to appear very early, by far the earliest we have seen this season, with Tonga-1017 audible before 08:00. And Kiribati 1440 showed up together with JOWF. So, we had hopes! Could this be the Mother of all New Zealand openings? Not even a distant relative... and at 11:30 a solar disturbance almost wiped up the band, as you can see below. The signal levels were eventually restored, but nothing out of the ordinary was heard the rest of the day. In the afternoon we got a visit from seasoned Finnish DX-er Jim Solatie, who had taken a break from Aihkiniemi to visit the Norwegian Arctic shores. Jim is a die-hard king crab lover, and incidentally (or not!) this was on the menu on Sunday. So, after an hour at the Guesthouse's new luxury sauna, we had a very pleasant dinner. For starters, OJ had prepared duck liver paste on sourdough bread. We had a 2010 Marcobrunn riesling auslese with the duck liver. The main course was the signature dish, king crab baked on a bed of sea salt and spices, with carbonara. This called for a 2014 Voglar Sauvignon. For dessert we enjoyed a selection of cheeses, such as Gruyere, Papillon Roquefort, Gorgonzola, Morbiere, Primadonna Maturo and Brie de meaux. The Marsala Superiore was an excellent wine for the cheese. The evening was rounded off with an excellent Grappa. The weather was not at all nice, with gale force winds and frequent rain showers. 3-4 Celsius. It cleared up in the afternoon though, and the evening was calm and moonlit. Jim enjoying a Supersonic beer. Overnight reception from North America had strong signals, alas the usual dominants were too dominant, so, sofar, nothing spectacular. We did review recordings from a few days ago though, and several new Texas stations were spotted from the Mount Loran beverage. What a magic antenna it is. Tonga-1017 came early today, and around 1300Z we had a small rush from New Zealand, but probably nothing new. We did note Star on 657 and 1494 in passing. But we haven't reviewed the recordings yet. Dinner today: Bruschetta from fresh sourdough bread for starters, followed by woked salmon with onions/carrots/ginger/whatever, woked with sour cream. Chocolate pudding with custard, and Grappa, for dessert. 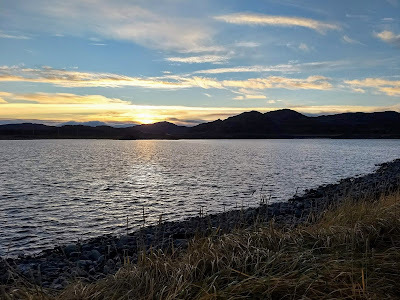 Weather today was excellent; light clouds, dry, light winds, a max of 5 Celsius. A few pictures below from the DX HQ today to illustrate. Tomorrow, Sunday, we will have a special visit from a very special guest star. Stay tuned! Arrival day! Ole arrived at around 09:30Z, while OJ Sagdahl and TJ Bråtveit showed up at 12:30. Overnight was not too interesting, but when we reviewed last night's Loran C recordings, there were some interesting stations, among them WFLF Pine Hills FL 540 at 01:00. Unfortunately, due to lack of hard drive space, the recordings stopped at 02:30. DX towards Asia was uninspiring. Nice to to notice that one-watt K9FD showed up with five spots on 630 meter wspr. The first KONG dinner was fish soup; carrots, celeriac, potatoes, ginger, leek and lots of fish. For dessert we enjoyed a chocolate pudding and custard, with some Amarone. Weather today was very nice; calm, mostly dry and a max of 6 Celsius. Sorry that I forgot to take any pictures. Today's radio link is a not too common station on 870. KONG37 is about to start! 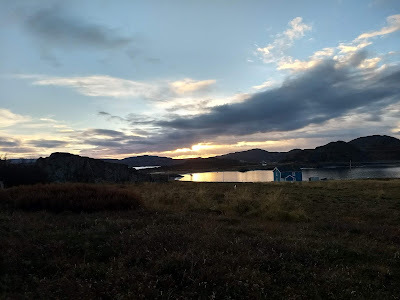 I arrived in Kongsfjord with the last batch of food this afternoon after meetings in Båtsfjord, just as the sun set. Ole Forr is scheduled for arrival Friday morning after a 1000-km drive from Andøya. OJ Sagdahl and Tore Johnny Bråtveit are due in the afternoon. King crab, reindeer tenderloin, salmon, haddock, cod, lamb and veal will be the main ingredients in the main courses we will be making. And the odd bottle of beer and wine... But DX-ing is the main priority! 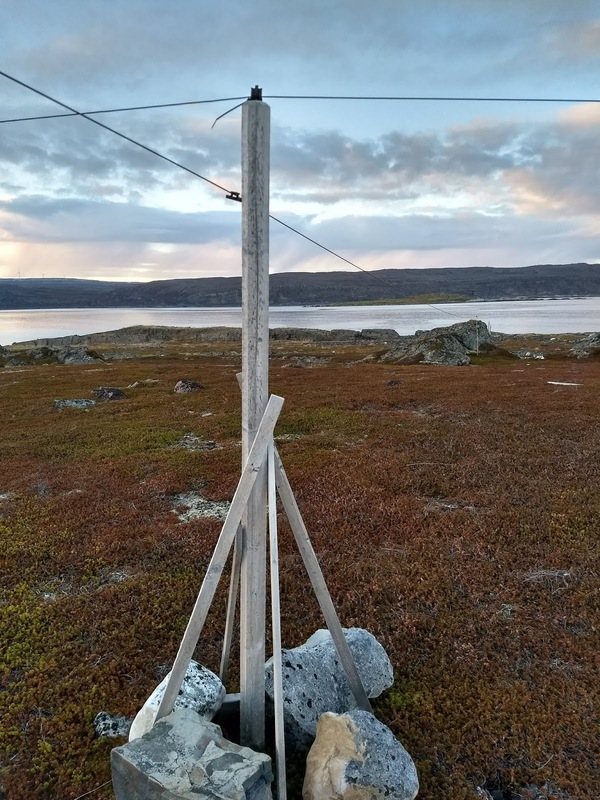 Four antennas in Kongsfjord and one 1000-metre antenna at Mount Loran will hopefully provide memorable moments. Updates here, on Twitter and on Facebook at DXing.info. OJ Sagdahl will also publish on www.kongsfjord.no. Stay tuned! 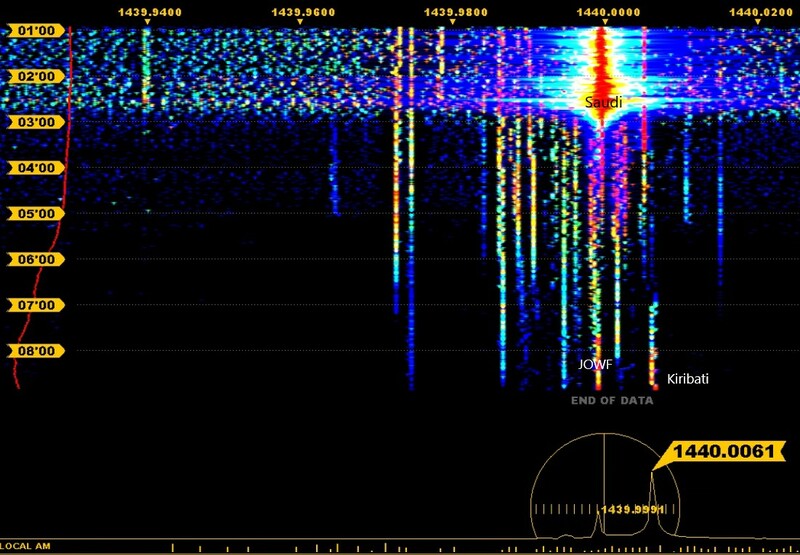 How Do You Copy a 5-watt MF Signal 14,000 km Away? 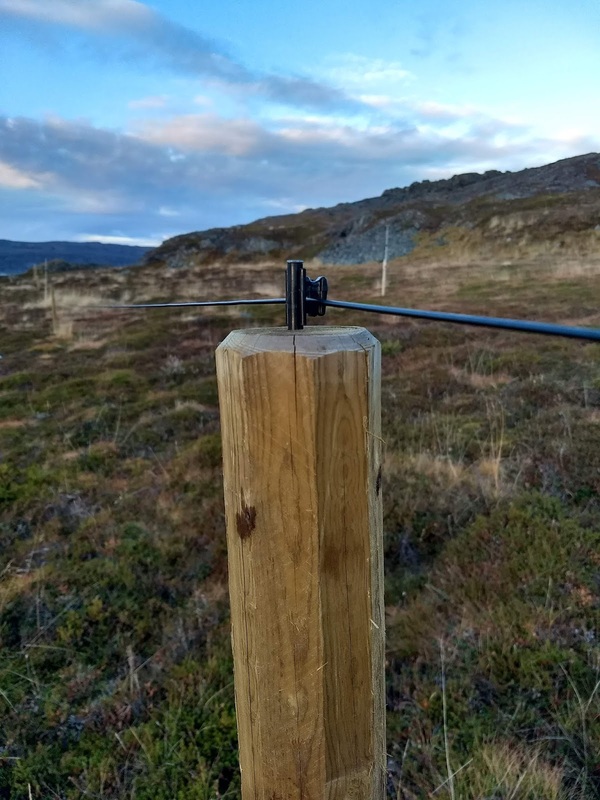 You do it with a KiwiSDR and a beverage antenna! For quite some time I've had some interest in monitoring low-band WSPR signals with my Kiwi. I have been restricted to 180 meters, because the most wanted 630 meter spectrum was covered with local PLC noise. Until recently. 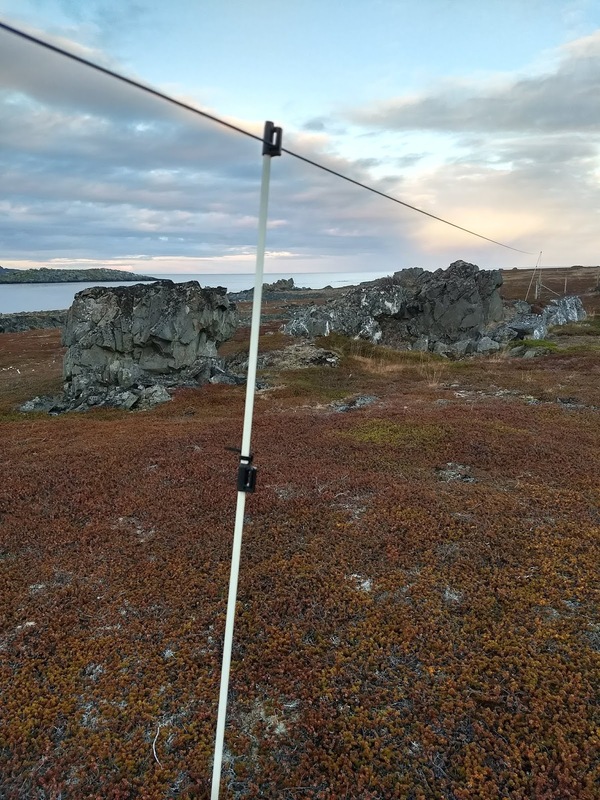 The band has now opened, so a few weeks ago I started monitoring the band a bit off and on, and noted Greece (5 watts) at 3,700 km as the most distant spot. But I wanted to hear further away! The ultimate for me would be to hear what I hear on MW: Pacific. I was advised that Roger, VK4YB, just outside Brisbane, QLD, might be the best bet for hearing Australia. So we exchanged some emails, and he wanted very much to be heard in Europe as well. But then the computer part of my KiwiSDR broke down, so I had to postpone the project. On Thursday though, the KiwiSDR was up and running again, connected to the 500-metre Asia/Pacific beverage. And today, at 1500Z, I logged three spots from 14,075 km away! And propagation was nowhere near outstanding. So, what's next? Japan? Hawaii? If I want to improve my personal record, I need to hear stations further south in Australia, or in New Zealand. And maybe, it might be worth exploring LF (136 kHz) as well? It's almost two weeks since my KongSDR refused to cooperate. After some fault-finding, including input from the excellent kiwisdr community, the conclusion was that the Beaglebone, the computer that runs the actual SDR, had failed. Unfortunately, that board does have a fail rate. I eventually orded a replacement (two, in fact) from Mouser which arrived at my home on Monday. 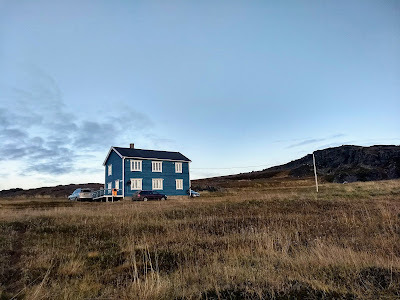 After I had replaced the Beaglebone everything was fine again, and yesterday I set it up in Kongsfjord, with a new name and link: http://arcticsdr.proxy.kiwisdr.com:8073/. This is also selectable on the link panel to the right. So! Fingers crossed and all that. The current Kiwi configuration has double capacity with up to eight receivers, but only two will see the spectrum. No other functionality is reduced or removed. "...CBS News update, on Newsradio 1240, and 93.5 FM"
This is what I heard last night at Midnight UTC. Despite stormy geomagnetic conditions, there were short openings, and with interesting stations at that. Enter WTAX, with a surprisingly strong signal. Friendly response this evening and a little chat about DX-ing in our youth.